Sure, the vintage and the winemaker and the producer contribute to a wine’s taste. The most important factors that contribute to your enjoyment of a wine have nothing to do with any of that. The company you were with, the occasion, the surroundings, the mood you were in and the food you were eating all play a very important role in your brain’s memory, when you recall drinking a certain wine. Last night, I dined at Gotham Steak in the newly renovated Fountainbleu Hotel and Resort in Miami with my friends Carolina and Amanda. All 3 of us are major Foodies and it is our exchange of annual birthday gifts to each other. Last night we were celebrating Carolina’s birthday. The day already started off with an exciting accomplishment as Carolina after some brief training, ran her first 1/2 Marathon in Miami. She finished the whole 13 mile run in 2 hrs 28 min. My friend Trevor is a seasoned, personable server at Gotham Steak so we knew we were going to be taken care of…and we were! 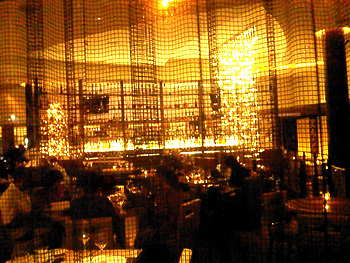 We started off with some classic cocktails followed by a complimentary glass of Blanc De Blanc Champagne. Trevor brought out an Amuse Bouche which was an Heirloom Tomato Salad with shaved radish, a goat cheese “FOAM” (I love those snobby restaurant terms) and a balsamic gel (Sounds like we were at a Hair Salon not a Restaurant lol). I had an appetizer of a mixed 1/2 dozen Oysters which came with traditional sauces with the addition of a Ponzu Sauce. We split 2 appetizers of Hudson Valley Foie Gras served on a molasses soaked brioche (Tasted like Pancakes) and crisp granny smith apples and then a phenomenal Wild Mushroom Risotto made to order with truffle oil mixed in. On to the main course. Carolina and I like our steaks cooked to the same temperature so we split a 25 ounce Dry Aged Bone In Ribeye which Trevor had the kitchen slice for us for sharing and Amanda who likes her steak a little more well done had a 14 oz NY Strip. Both steaks are cooked over a hardwood grill and although cliche were “Like Butter”. 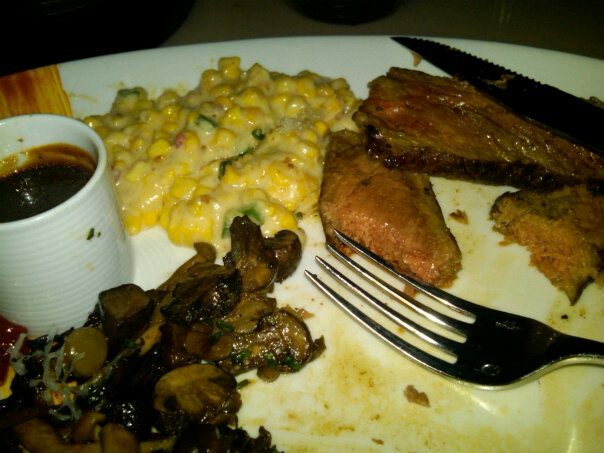 For sides, we shared, Creamed Corn with Gruyere and Jalapeno and a WOW of a plate of Wild Mushroom Fricassee which were sauteed down perfectly. Plus, I had to throw in an order of their famous Truffle Fries which were Amazing! I always bring my own wine from my private collection. I chose the #20 Wine of The Year a few years back on Wine Spectators Top 100 List. 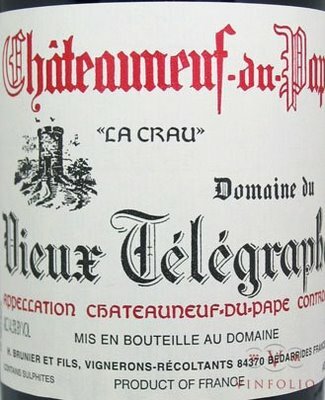 It was the 2004 Domaine Du Vieux Telegraphe Chateauneuf Du Pape La Crau rated 94 Points. The wine was the perfect match for the rich steak and the rich sides. It displayed a beautiful bouquet of Minerals, Red Berries and Black Licorice and with the heavy marbling of the steak the silky raspberry mid palate and soft tannin finish glided right over the buttery flavors of prime beef. As you can see, even though this is a Wine Blog, the smallest paragraph was about the wine. I think the elements listed at the beginning about the great food at a beautiful restaurant with a friend of mine who is a great server and the company of great friends celebrating a birthday all contribute in a major way as to how I recall how that wine tasted. It could be possible that the same Chateauneuf Du Pape wouldn’t have the same tasting notes if I was in a bad mood, sitting at home and popped it open with some frozen turkey burgers on my grill to wash away my rough day at work. As Wine Experts, I think we often forget those important factors when reviewing a wine. PreviousWhite Wine With Fish, Red Wine With Beef….An Old Wives Tale! NextAny Reviews Including Wine Are OPINIONS..Take Them With “A Grain Of Salt”!